Breakfast bagel sandwiches aren’t exactly the most diabetes-friendly breakfast. This vegetable-packed recipe allows you to enjoy a satisfying bagel breakfast without the blood sugar spike. Choose a 100 percent whole grain bagel and keep it open-faced for a filling and fiber-rich start to your day. Beat egg in a small bowl. Cover skillet with nonstick spray and heat on medium. Add beaten egg and cook, stirring frequently, until cooked through. Spread toasted bagel with hummus. Top with cucumber, roasted red peppers, and arugula. 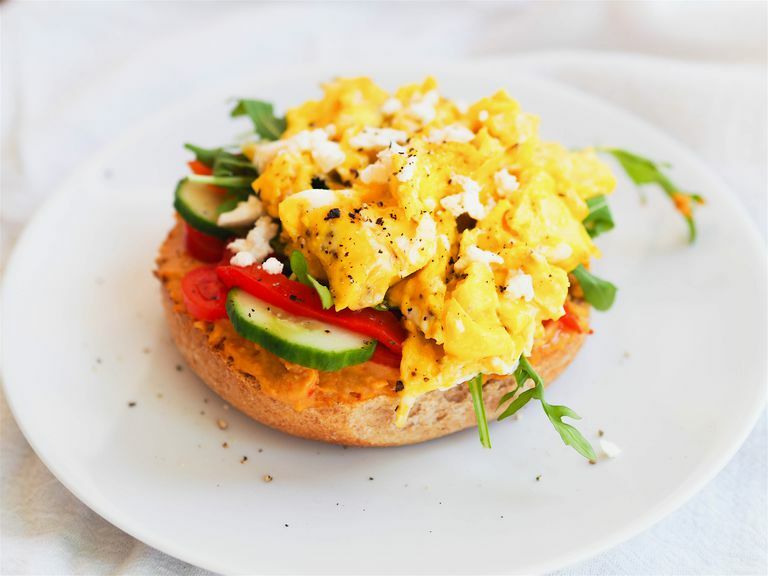 Top with scrambled egg and sprinkle with feta cheese. Season with salt and freshly cracked black pepper, if desired. It’s best to look for a bagel labeled 100 percent whole grain or 100 percent whole wheat versus ones labeled wheat or whole wheat. This means all the flour used is whole grain, rather than whole grain or whole wheat, which often use a blend of refined and whole grain flour. If you cannot eat gluten, there are many whole grain, gluten-free bagels on the market. Or, swap in a slice of whole grain, gluten-free toast. With so many different flavors of hummus on the market, you may want to add a kick of extra flavor to this recipe using spicy hummus, lemon hummus, or roasted garlic hummus. You could even use guacamole or ripe avocado mashed with a bit of lemon juice. If you can’t do a bagel without cream cheese, consider reduced fat, which lowers the saturated fat content without affecting the taste too much. I love this breakfast bagel with chive or roasted vegetable cream cheese. In the summer, swap the roasted red peppers for a thick slice of juicy, fresh heirloom tomato. My trick for making extra soft and creamy scrambled eggs is to cook it over moderate heat while stirring constantly. I like my eggs a little soft, but you can cook them until well done if desired. Scrambled eggs are extra delicious with a pinch of dried dill or basil stirred in. If you prefer a runny yolk, fry your egg over moderate heat, covering it with a lid for just a moment before it’s done to help the white set.